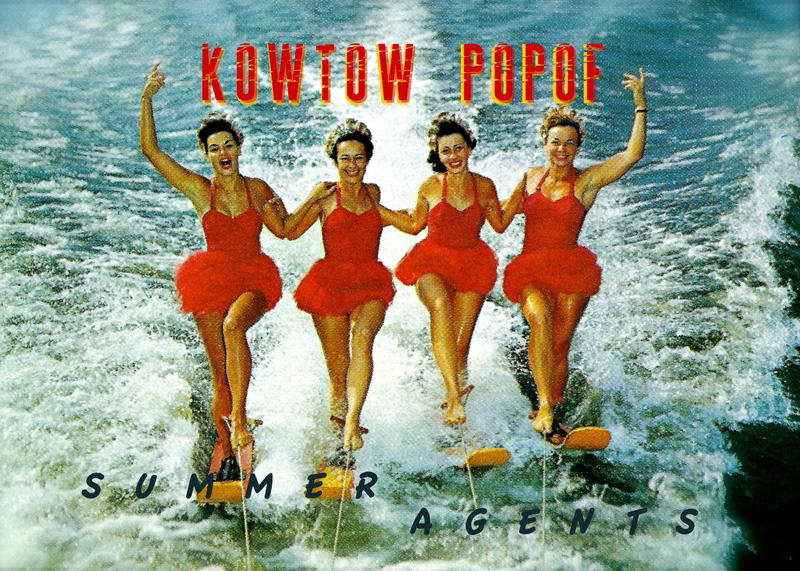 Summer Agents, the latest musical salvo from Kowtow Popof, is like a cold beer (or two) on a hot summer day — a refreshing draught to temper the withering climate while promising gradual inebriation. The four-song instrumental EP, originally released to insiders on Bandcamp in late summer, is now available for global consumption. Then the main riff kicks back in mightily, and the tune fades into the cooling summer evening. Next up is “Deviled Eggs,” an organ-driven tribute to summer picnics, recalling the carnival atmosphere of an old boardwalk or the clammy air of a school dance. Then comes “Tiny Manster,” evoking a lost Vince Guaraldi Peanuts track before its drive-in creature-feature plot delivers a collision between a 1959 sci-fi flick and some Elton John classic. Finally Martin Kennedy’s atmospheric remix of the title track washes up on the shore like a gentle wave… and the original’s sunny, enjoy-it-while-it lasts rock recedes to a dusky, last-call reflection on times gone by. Go on, brave listener — slake your thirst with a taste of the Summer Agents.